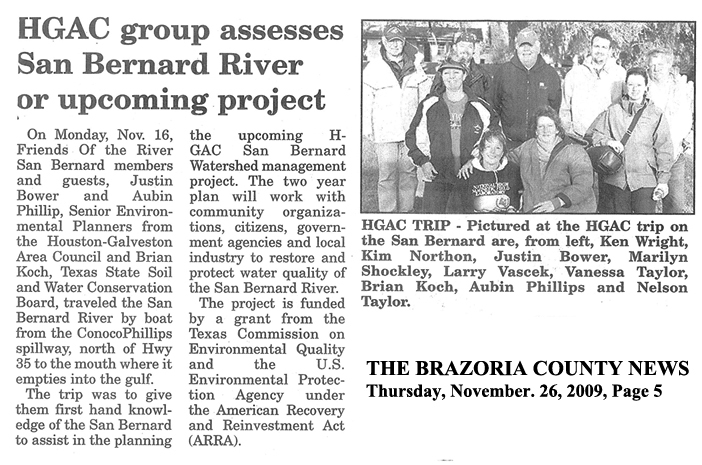 "Volunteers Clean the San Bernard"
"Tracking Pollution - River residents say sewer plan pose little threat if regulation followed..."
"Plant near San Bernard River seeks reduction in required e-coli testing..."
"River residents express concerns to TCEQ" - Residents from along the San Bernard River voiced their concern during a public hearing Tuesday about a small sewage plant's discharge that could eventually end up in the river's water..."
Ange Ronayne points out trash along the banks of the San Bernard River Tuesday as she and her husband, Tom, take their boat on the water to look for garbage. 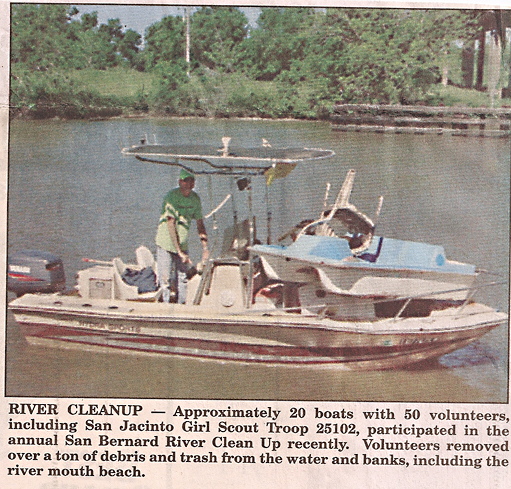 It's a never-ending challenge to fight the trash that finds its way into the waterway, but it’s one the Friends of the River San Bernard and others who care about the waterway are happy to take. 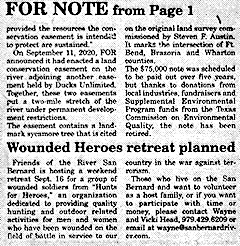 To be sure, however, even if the job never quite ends, FOR members say conditions have improved since their annual river cleanup began a few years ago. Although the job is not as big as it once was, the group is asking for folks who are interested in helping with the effort to stop by the river at 9 a.m. Saturday, and that’s especially true for people who have their own watercraft. Most of the trash to be collected is predictable. Lots of whole or parts of Styrofoam coolers, various types of plastic wrappers and bottles, cans and the like are visible along the shoreline of the river. While that sort of trash can be found from the spillway north of Highway 35, and downriver to the mouth, it does tend to cluster in places, most likely because that’s where it was discarded, Ronayne said. “Boat ramps are the worst,” he said. 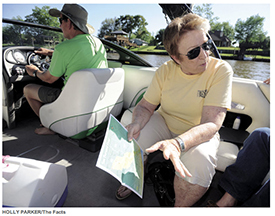 Linda Wright looks over a map of the San Bernard River as she talks about Saturday’s cleanup. But that, too, has improved over the years, Wright said. Other than what more-or-less could be considered picnic trash, it’s not difficult to find 5-gallon buckets and a variety of other plastic items, and household appliances, including even the proverbial — but in this case, quite literal — kitchen sink. Mostly though, people have gotten much better about not dumping that sort of stuff, and most of the larger things still on the river’s banks were abandoned years ago, Tom Ronayne said. “This stuff has been here long enough that it looks like part of the river,” he said, indicating a rusty washer and dryer components lying in the mud at the water’s edge near low tide. Items like that, however, appear to be the exception, and it’s certainly not difficult to find long stretches of the bank where there is not a single man-made piece of debris. That’s because of efforts to increase awareness about the effects of pollution among locals and recreational river users, Linda Wright said. It’s also because the people who live on or near the San Bernard care deeply about it, she said. “We’re rather proud of the fact that it’s a clean river,” she said. 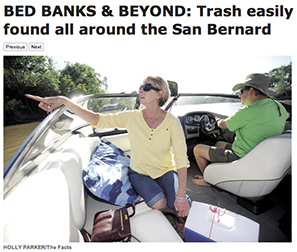 The next big trash-related challenge likely will come after the next big rain upriver that will wash garbage there down to the southern end of the San Bernard, Wright said. Access issues are different above the spillway, she said, which makes putting together a preventative cleanup effort upstream unfeasible. That means the problem will just have to be dealt with when it arrives. “You pretty much just have to wait for it to come down,” Wright said. 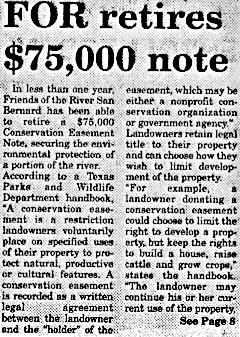 Alan Nieschwietz covers West of the Brazos for The Facts. Contact him at 979-237-0151.